RD Racing Ream is the name of the race team that anyone can join and go where you want to go racing. Our goal is to get you ready, put your bike and you on the start line and assist you during the race to make sure you have all that you need to park on the other side of the finish line. Every year we listen where you; the riders want to go and make it happen. We have plenty of racing- and team experience under our belts and know the organizers personally to make it as easy as possible. We take care of all logistics, administration and payment while you concentrate on getting fit and the racing part. - Service truck fully equipped with all you need to make it through the race. Lights, tents, tables, chairs, tools, welder, power tools, generator, material to build or repair stuff, nuts and bolts, zip-ties, tape and whatever. - RD's navigation equipment with standard prices. You can choose to service the bike yourself or let RD worry about that, while you relax by the pool. We also have a plan B for those who choose self service; We are obligated to help you if you are too tired that day or have a major repair you need help with for standard hour rate. RD brings spares of the common parts. Navigation details, sensors, RB-holders, trips and MRS systems. These have the standard prices of the webshop. First of all, read all pages on the official website containing the route, dates and regulations. It might vary from year to year, so make sure you understand it and you are ok with it. Questions you ask by e-mail to us or on soe.se. - Contact us and tell what rally you want to race, or if you want to go where the team goes. - We all meet up about two weeks before the start in Sweden to shake down the bikes, leave equipment and the bike to the service crew. - Service crew transports the bikes and equipment and arrive a couple of days before the riders, who fly down. - RD helps you through scruteneering and anything else needed. - Efter finishing we load up again and leave for home. - You collect your things on one of the following weekends. You pay everything to RD, exept the flight. Everyone pays the same and you can order tires, entry, hotel and mousses all in one go. The calculations are open for everyone to see. RD takes care of the administration, payment, hotel booking, tire- and mousse orders, truck diesel, road tolls and ferries for the team free of charge. Also included: Insurance, team t-shirt, MX jersey with your name and help during the race. We can of course build your bike from scratch, rebuild the bike you already have or supply equipment for it. 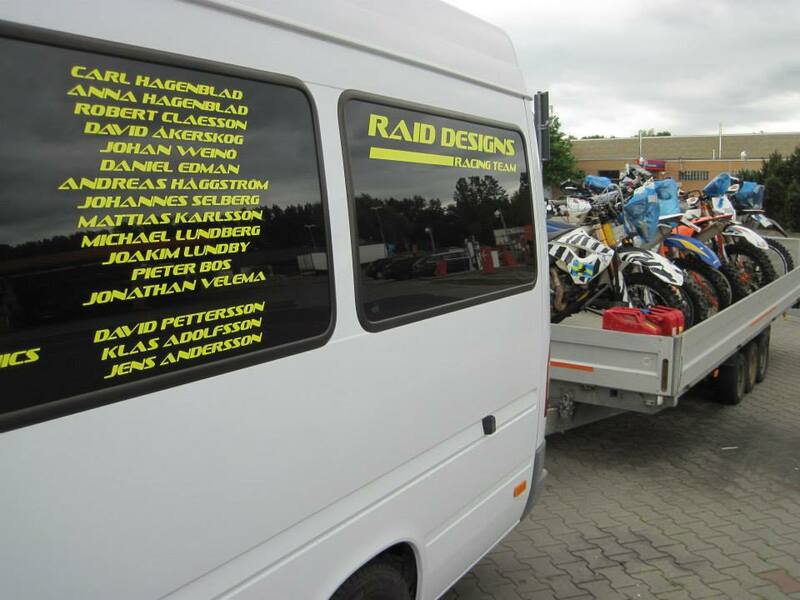 This is done by Dakar mechanic Calle Hagenblad. Questions on what to get, how to set up etc, same channels as above, e-mail to us or on soe.se. You are allowed one 60l plastic rally box (Bauhaus artno: 9009617A) and also we have two shared boxes with the stuff everyone can use (chains, battery, handlebars and such.